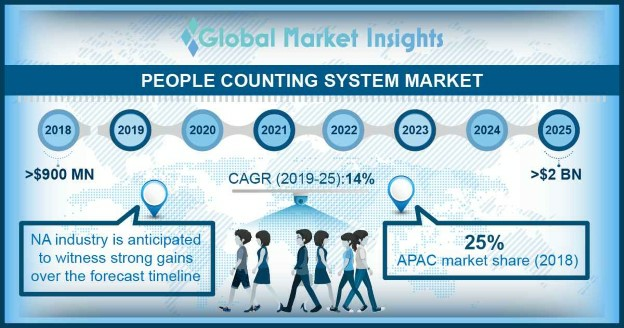 People Counting System Market size is set to exceed USD 2 billion by 2025; according to a new research report by Global Market Insights, Inc. The people counting system market is growing at a rapid pace owing to the adoption of digitized systems for supporting regular operations across several application industries. These systems provide several operational enhancement benefits to installers such as staff optimization and tracking the busiest time slots. Moreover, the increasing awareness of business intelligence platforms in various industries such retail, entertainment, and hospitality are generating high demand for the advanced customer tracking solutions. The in people counting system market is also witnessing technological evolution, such as the development of 3D stereographic components, thermal imaging counters, and behavior analysis technologies, which is compelling the application industry players to adopt these advanced technologies. Increasing demand for the effective technologies to analyze, detect and convert potential customers, and for enhancing business sales and profitability is the major factor propelling the people counting system market. Several industrial sectors such as hospitals, restaurants, pubs and clubs are witnessing high adoption of the technology for tracking the number of customers entering or exiting the facility. These systems help companies to develop effective sales and marketing strategies for attracting the customers and analyzing the buying behavior. These strategies will further help them to compete with the major companies in terms of customer base and sales revenue. Such factors are predicted to boost the people counting system market growth. In 2018, the video-based technology accounted for around 60% of the people counting system market share and is witnessing high adoption owing to increasing technological advancements and innovations in surveillance and monitoring systems. Manufacturers in the market are engaged in developing different types of camera technologies that provide enhanced and clear videos and images. Integration of the video-based technologies in these counting systems provides several advantages to the customers such as remote video capture, easy adjustment to lighting & temperature and effective software upgrades. These advantages are encouraging companies to implement video-based systems in their facilities, driving the people counting system market. Software based people counting systems are witnessing high growth owing to the increased requirement for the effective tools for managing the hardware components and to offer an effective platform for providing inputs and receiving output from the system. These software tools are anticipated to grow at a CAGR of around 15% over the forecast timespan and allow the operators to manage the systems functions, operations and perform several statistical tasks to improve the system performance. Several manufacturers are engaged in developing software technologies that will offer easy connection and authorization to these counting systems. For instance, cloud-based storage tools are being incorporated in these systems for easy accessibility and storage of the counting data. Such factors are predicted to drive the adoption of software tools in the people counting system market. The North America people counting system market is growing at a rapid pace owing to the presence of several system developers and customers in application industries. The rapid increase in retail sector establishments and the adoption of early technical advancements in the U.S. are the major driving factors in the market. The region has advanced transportation facilities that deploy automated management systems for efficient passenger service provision and staff allocation, which is supporting industry expansion. Moreover, rising smart city projects and smart buildings in developed economies is creating a high demand for systems to support building automation initiatives. Major companies in the people counting system market include Axis Communications AB, Eurotech, FLIR Systems, Inc, Infodev Electronic Designers International, Inc., InfraRed Integrated Systems Ltd., Iris-GmbH Infrared & Intelligent Sensors, RetailNext, Inc, HELLA Aglaia Mobile Vision GmbH and V-Count among others. These players are developing specialized passenger counting systems with varied capabilities that provide better management capabilities to different application segments. For instance, in December 2018, Meitrack announced the launch of its new passenger counting system for private & public transportation applications consisting of two stereo cameras, vehicle trackers, passenger counter, etc. Such factors along with the need to manage increased passenger traffic at railway stations and airports are driving adoption of the technologies in people counting system market.